The senses are integral to our existence. They are the instruments through which we perceive and engage with the world around us. However, when we get carried away by this engagement and come to believe that happiness lies in outer objects and sensory gratification, we forget that the true source of joy and fulfillment lives within us as supreme Consciousness, our own Self. Thus, if we want to attain full knowledge of the Self, an important prerequisite is that we master the senses rather than be mastered by them. as bad horses, a charioteer. This metaphor speaks to the close relationship between the mind and the senses and also to the crucial role the mind plays in bringing the senses under control. In Indian scripture and philosophy, the senses include the five powers of perception (sight, hearing, taste, smell, and touch) and also the five powers of action (locomotion, dexterity, elimination, reproduction, and speech). 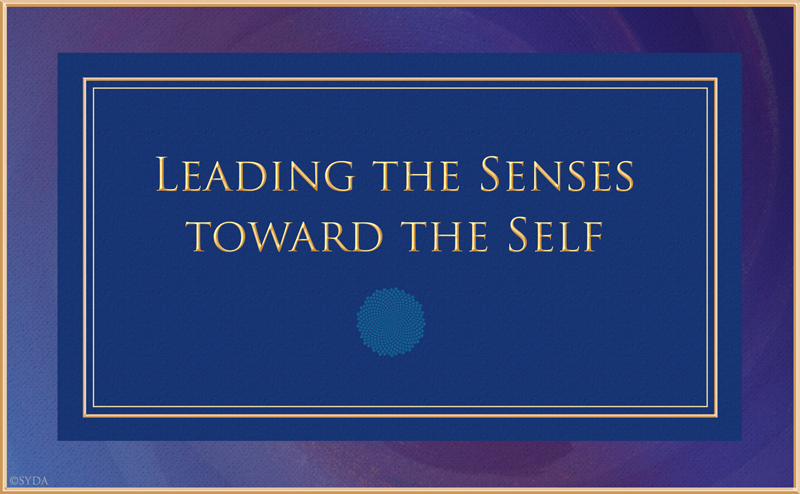 The function of the senses is to serve the mind as its instruments of perception and action. The mind is the instrument that guides and controls the senses, whether they are moving inward or outward. In yoga, the process of mastering the senses is known as pratyāhāra, which literally means: the “withdrawal of the senses” or “turning the senses inward.” The sage Patañjali, in his Yoga Sūtras, includes this process as one of his “eight limbs of yoga.”2 This schematic, step-by-step guide to meditation leads the seeker on an inward journey from the waking state to samādhi, or meditative absorption. In samādhi, the mind is completely quiet and rests, thought-free, in the witnessing awareness of the Self. You are meditating with a group of fellow sādhakas. The person next to you is new to meditation. She finds it hard to sit still, and she is wearing a jacket that rustles every time she moves. You become increasingly sensitive to the sound, and soon it occupies your whole awareness. You are irritated because you feel this woman is spoiling your meditation. In the end, you get up and move to another part of the room, possibly disturbing several other meditators in the process . . . In this example, the first sense in play is your power of hearing and the object of attention, the sound of the rustling jacket. By choosing to listen to the rustling, you allow your sense of hearing to pull your mind outward, and set in train the thoughts that prompt you to engage another sense, your power of locomotion. Patañjali’s remedy is for you to apply your will and withdraw your attention from the rustling sound. As your mind withdraws, you may still be aware of the sound, but it no longer bothers you. You simply witness it, without judgment. As you continue to meditate, you may become oblivious of the sound. Often, when we meditate, even when there is no outside distraction, the mind remains outgoing in its focus. For example, just the other morning, when I sat to meditate, my mind was excitable and kept returning to something I was writing. When I became aware of this, I observed it dispassionately, reminding myself, “I am not this thought. I am the awareness of this thought.” This had an immediately calming effect on my mind and, in moments, I had settled into “awareness of my awareness,” where thoughts were present but I was not focused on them. At other times, “objects of attention” of a quite different order may appear in meditation. These images, thoughts, sounds, or sensations have no immediate connection or relevance to our waking lives. Instead, they seem to arise spontaneously from the deepest level of Consciousness. Sometimes they appear ready-formed; at other times they emerge amorphously and coalesce into form. They can be of arresting beauty and phenomenal detail. Often, they involve soothing light or vibrant color. The temptation, when such phenomena occur, is for the mind to spring into action: “Quick, something’s happening! You’re having An Experience!” And pouf!—the vision is gone, and with it our meditative state. In Patañjali’s scheme, pratyāhāra equips us for the three remaining stages of our inward journey: these, he says, are dhāraṇā, which is repeatedly focusing our attention on an inner support that draws us deeper into meditation; dhyāna, when we achieve unbroken focus on that object; and samādhi, when we are so absorbed in meditation that there is no longer even any sense of “I” and the mind rests in the Self. In Siddha Yoga meditation, there is another and most vital support on the inward journey: the grace of the Siddha Guru, who, having realized her oneness with supreme Consciousness, lives in that knowledge and is able to impart it to others. One of the ways Gurumayi does this is through mantra. The meaning of the mantra reminds us of why we are meditating. The repetition of the sounds may act as an inner object on which to focus the mind. However, the true power of the mantra lies in the fact that it is a vehicle for the Guru’s shakti. When we repeat the mantra silently and combine each repetition with the incoming and outgoing breaths, our focus is enhanced by the power of grace, and we are drawn deeper into meditation. There is great compassion in Gurumayi’s words; an acceptance of the senses being the way they are, and the provision of an effective and uplifting solution. This is surely one of the gentlest and most enjoyable ways to calm the restive nature of the senses. It is also one of the most powerful. The energy of the mantra quiets all thoughts and leads us to that delicious state of still, deep, meditation, when, senses indrawn, we rest in the Witness. Then, whether we are meditating alone, or in a hall surrounded by other people, we are in the presence of our own inner Self. 1 Kaṭha Upaniṣad 3.5-6; Patrick Olivelle, Upaniṣads (New York: Oxford University Press, 1996) p. 239. 2 Patañjali’s “eight limbs of yoga” comprise yamas, what thoughts and actions to avoid in daily life in order to have a peaceful mind; niyamas, what positive actions to take; āsana, posture; prāṇayāma, regulation of the breath; pratyāhāra, mastery of the senses; dhāraṇā, inner focus; dhyāna, meditation; and samādhi, meditative absorption. Collection of Yoga Aphorisms, 2.29. Swāmi Hariharānanda Āraṇya, Yoga Philosophy of Patanjali, (SUNY Press, Albany, 1983, Appendix D), p.449. 3 Yoga Sūtras 2.54; Swāmi Hariharānanda Āraṇya, Yoga Philosophy of Patanjali (SUNY Press, Albany, 1983, Appendix D) and Christopher Chapple, The Yoga Sūtras of Patañjali, (Sri Satguru Publications, Delhi, 1990); rendered by Swami Shantananda © 2018 SYDA Foundation. 4 Yoga Sūtras 2.54; Swāmi Hariharānanda Āraṇya, Yoga Philosophy of Patanjali (New York: SUNY Press, 1983) p. 246. 5 Yoga Sūtras 2.55; ibid, Swami Shantananda. 6 Gurumayi Chidvilasananda, Kindle My Heart Vol. 2 (South Fallsburg, NY: SYDA Foundation, 1989), p. 209.